September marks the end of summer here in the mountains of Western North Carolina, and what better way to bid farewell to lovely summertime than feature one of our lovely summer residents before he flies to his winter home in Central or South America? 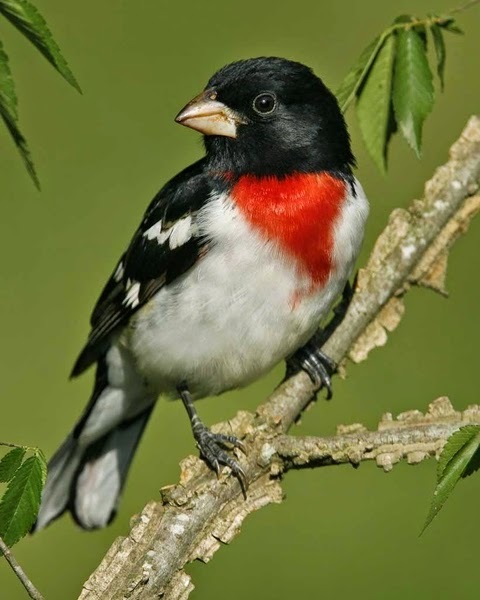 Therefore, we introduce you to the Rose-breasted Grosbeak, our September 2014 bird in our 12 Months of Birding at the Inn series on our blog. The Rose-breasted Grosbeaks, especially the males, are pretty easy to spot. Males have black heads, white chests, and black and white patches on their backs. They also have a rich red V-shaped patch from their throats to their chests. Females are mostly shades of brown, with a long, white eye stripe. Rose-breasted Grosbeaks also have large beaks, which is not a surprise for a bird with “grosbeak” in its name, and their beaks are triangular in shape. 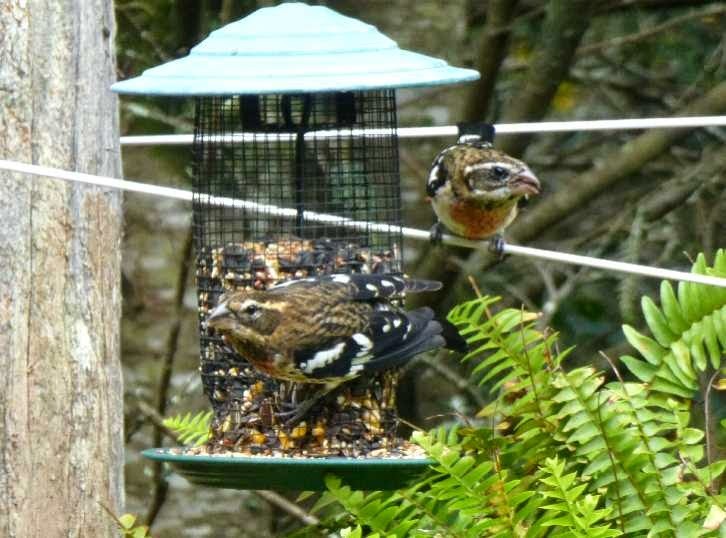 One great way to attract Rose-breasted Grosbeaks is to have sunflower seeds, which these birds loooove. They also eat other seeds, as well as fruit and insects. unusually happy.” If you know what an American Robin’s song sounds like, imagine an American Robin in a really good mood and you have the Rose-breasted Grosbeak’s song. With a pleasant tune filling the trees around the Inn on Mill Creek B&B, our summers are definitely happy with the Rose-breasted Grosbeak around. This entry was posted in Uncategorized and tagged 12 Months of Birding at the Inn, birding, Summer by Inn on Mill Creek. Bookmark the permalink.